Breaded French toast, before cooking. This casserole was easy and pretty tasty. It was a little too spicy for Girl, but the rest of us liked it. I toasted the fideos in the oven (375 degrees for 8 to 10 minutes, or until evenly golden browned), instead of in a skillet in oil, to simplify cleanup and also cut the fat content a tiny bit. I also added some frozen peas, because, of course, I am the meanest mom on the planet. This soup (from the always-awesome “Family Style” page in Bon Appetit magazine – March 2009 issue) was very tasty, but I’m not sure that the “herb swirl” added much in the way of flavor. In terms of presentation, too, it just seemed to get lost in the soup, so I would recommend either skipping it (one less skillet to wash!) or just sprinkling some fresh herbs directly into the soup before portioning. The soup was very tasty, though, and quite easy. A hit with all four of us. I forgot to buy the Italian bread to make the Parmesan toasts, so I improvised with what I had on hand. Any resemblance to halved, leftover hamburger buns is purely coincidental. I’ve had a run of bad luck with recipes lately. We tried these Banana Bran Muffins from Barefoot Contessa, but found the molasses flavor too strong and the bran texture overwhelming. If anyone has a bran muffin recipe they’d recommend, please let me know! These tacos (from February 2009 Bon Appetit magazine) were pretty tasty and quite easy. The beans could have used a tiny bit more seasoning, so I would up the amount of cumin, and maybe add some oregano, too, if I make these again. I substituted queso fresco for the feta. All of us liked these except Boy, and I think that he would have liked them better if the beans were spiced up a bit. We made Michelada cocktails to go with these, which were really not to our taste. The recipe sounded like it had potential (it’s the recipe from El Chile restaurant, here in Austin), but I think they just weren’t our “thing.” I think that I would have liked it better without the Worcestershire. This was SO yummy and quite easy. The recipe is from the same episode as Alton Brown’s “Orange Delicious” and has a pretty similar ingredient list. I had been looking forward to trying this for weeks. I usually can read over a recipe and quickly imagine what it will taste like and even whether or not we are likely to enjoy it. From the moment I saw this one, I thought it sounded fantastic. We LOVE Cara Cara oranges and, of course, we love caramel and figured that this dessert would be the perfect pairing of those two things. I had prepared it ahead of time and had it frozen, according to the recipe directions, waiting for the perfect night to bake it. Well, I guess my recipe instincts were totally off, because this was just AWFUL. Terrible. Inedible, really. I did make some adaptations: I used Cara Cara instead of blood oranges and I realized, after assembly, that I probably didn’t slice the oranges as thinly as I was supposed to, because they didn’t get all shrively-dried looking like the ones in the magazine photo. Honestly, the tart might not have been too bad on its own (or maybe with some vanilla ice cream), but I pretty liberally drizzled each serving with the salted caramel sauce, rendering it too salty for anyone (except maybe deer in search of a salt lick) to consume. The tart, though, for all the work that it required, really just wasn’t stellar. The best thing about this recipe was the crust/dough, which was flaky and sugar-crusted. The caramel would be good, too, without the salt (or with the quantity vastly reduced.) I might try to make this tart again with berries, because the dough really was delicious, but the recipe, as is? No, just NO. This recipe from November 2008 Gourmet magazine was straight-up fabulous. There’s nothing more to say. It was phenomenal. The preparation instructions are VERY specific and include the exact bread-to-soaking liquid ratio, plus exact soaking times. Preparing this french toast and seeing how crusty-delicious it turned out made me realize that I’ve been over-soaking my french toast in the past. I’ll definitely be using a lighter hand in the future. If you’re from Texas, this is a recipe that you remember eating all your life. It was the sort of thing that you’d eat when you went to visit your grandmother or went to a church potluck. Historically, it was made with some type of cream soup, but there are as many variations of this recipe as there are branches of the Junior League in Texas, but you must always include chicken, tortillas and a can of Ro-Tel tomatoes. I decided to try an updated “fancy pants” version of the recipe (Hubby loves anything cheesy and vaguely spicy, so I was sure it would be a hit, at least with him.) The “fancy” version definitely has more flavor than the original, but it’s still pre-cooked chicken, with soggy tortillas and lots of cheese, so it’s remarkably similar to the original. A bit spicier (too spicy for Girl, in fact.) Both the original and the “fancy pants” recipes can be found here. This casserole isn’t “gourmet” at ALL and certainly isn’t anything to look at, but if that’s what you’re looking for, you’re missing the point. I did change the recipe around just a tiny bit. I roasted a whole chicken (*directions below) and then cut the meat up from that, instead of frying the chicken pieces in olive oil. Once the chicken was done, I cut the meat up (all but the legs and a little bit of the breast, which I’ll save for another use) and sprinkled it with a little lime juice and ancho chile powder. I skipped the step of pre-heating the tortillas, because I was feeling a little lazy and I had hungry people whining at me. Preheat oven to 400 degrees. Remove packet (gizzards and neck and other nasty stuff) from inside the chicken and discard it. Rinse chicken thoroughly, inside and out, with cold water and pat dry with paper towels. Take a whole lemon and prick it thoroughly, all over, with a fork. Insert it into the chicken’s…ummm…”cavity.” Gently peel the skin up from the breast, starting at the neck end (don’t remove it, just make a “pocket”.) Remove any extra fat that might be inside the chicken’s cavity. Spread it out in the “pocket” that you’ve created between the skin and the breast. Generously season the chicken, inside and out (and in the “pocket”) with kosher salt and pepper. Feel free to add herbs, too, if you’d like (I usually don’t, depending upon what I’m going to do with the chicken and whether or not I’m planning to use the carcass for stock later.) Rub the chicken’s skin all over with a lightly coating of olive oil. Bake the chicken for about one hour or until a thermometer inserted into the meaty part of the thigh registers 170 degrees. 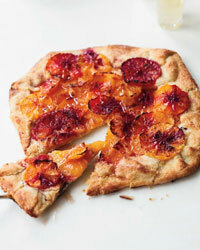 This recipe is from January 2009 Cooking Light magazine. These were absolutely delicious. They were a little more labor-intensive than I’m used to for a simple snack cake recipe, but I think that you might be able to skip the banana roasting step, if you’re in a real hurry. I haven’t tested that theory, but the banana flavor didn’t seem much different to me than regular banana bread or other non-roasted recipes. These were VERY good, though. I shared some with someone that is doing some work around our house at the moment and she emailed later that afternoon, insisting that I share the recipe with her. These would be great for any kind of potluck or food “gift” for a teacher, someone that’s had a new baby/illness or when it’s your turn to bring snacks for soccer, girl scouts, etc. Yum.